Looking to make some homemade instant Oatmeal Packets that you can customize and make for less than half the price of the store version? Here’s the recipe! I’m one of those people that needs breakfast right away every single morning. (Unlike my hubby who rarely wants breakfast.) I wake up a hungry bear that needs something satisfying to eat! Yummy, fake coloring and mysterious “natural flavors”. Just what I wanted in a breakfast! The regular price of this on Amazon per 12 count box is around $3.50. So let’s mix up some of our own! Since these are so hard to make ( 🙂 ) I thought I better include a picture tutorial. 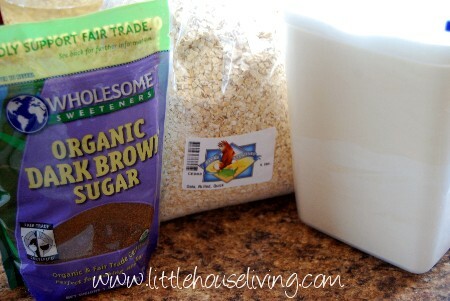 In your little baggie or jar, add the powdered milk or whey. You can make them in jelly jars. If you’d rather, you could also just times this recipe by 5 or 10 and place the whole thing in a jar to keep at home. Just measure out a little more than 1/2 cup of mix for each bowl. When you want to make a packet just add 3/4 cup of hot water or milk and stir. 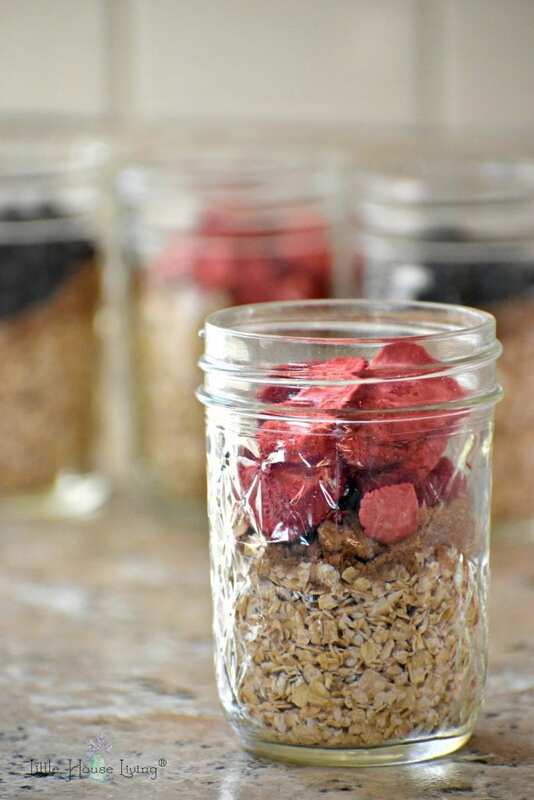 You could also add dried fruit to make different flavors. I paid $3.60 for 5 pounds of organic oats. There are 5 cups of oats in a pound so each 1/2 c. of oats per recipe cost me $0.07. The sugar and powdered milk are really small amounts but I will guess it costs about $0.15 for each “packet” including the oats. That makes the total $1.80 for a 12 count (which is what’s in each store boughten box) or a difference of $1.70. About 50% off the cost of the store bought and I my version was even organic! 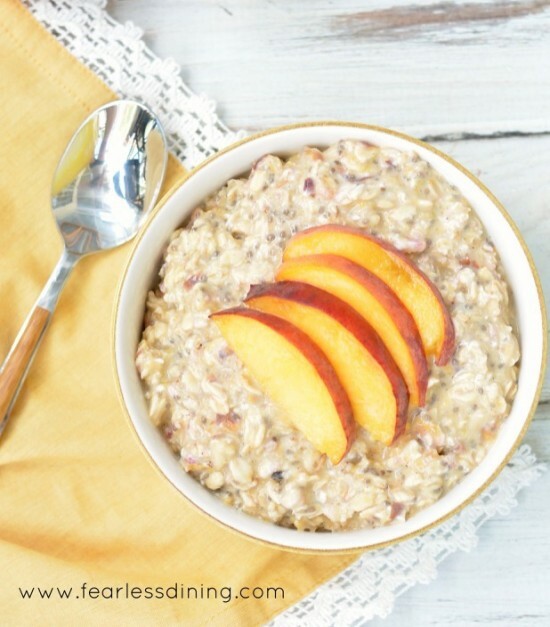 Get some great ideas on how to Make Perfect Oatmeal and add in ideas here! Looking for more mixes that you can make quickly and easily? 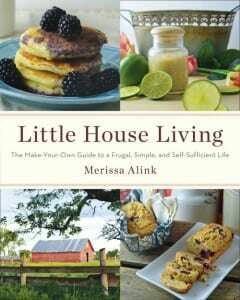 My book,Little House Living: The Make Your Own Guide to a Frugal, Simple, and Self Sufficient Life has over 130 recipes just like this one! 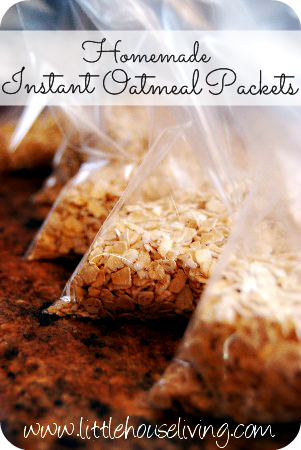 Who knew that homemade instant oatmeal packets could be so easy! What mix do you want to see me make next? 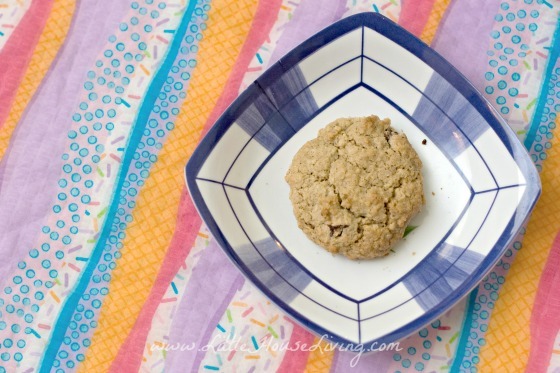 Find even more make ahead breakfast ideas! I make instant oatmeal all the time! My babies love it. I have done this before. I used raisins for some and those toddler freeze dried fruits. My husband loved it. He takes his breakfast to work with him most days. I was just wondering how I was going to make fruit flavors and how expensive it would be to get dried fruit and then you reminded me of the perfect toddler freeze dried fruit, stocking up on the next sale! Perfect timing for this post! I am getting ready to send my oldest off to college and we are trying to figure out easy dorm foods! This will be perfect!! This sounds like an interesting idea. How would you go about getting different flavors such as peach, strawberry, blueberry, banana, etc…? By adding dried fruits, you can either dry them yourself or buy them from the store. We just keep ours in a rubbermaid type container with a 1/3 C measuring cup in it. Children can fix their own, and no baggie waste. I used a label maker to put the instructions right on the container. Did you order your oats online somewhere? I’d like to find a deal like that. Oh Thanks anyway. We are stationed overseas right now so I cant do the Azure right now. I was hoping it was somewhere that did shipping :). I do have their link in my faves though for when we move back next year. You could try searching on Amazon, I’m sure they carry something good too! This is such a great idea! 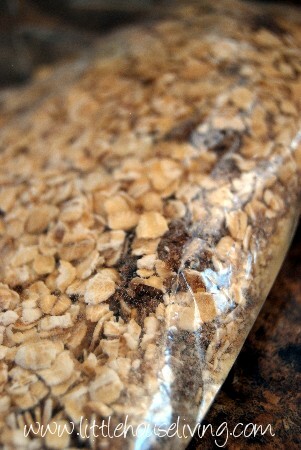 I get the organic oats from Azure too and eat them at home YET I’d buy the all natural oatmeal packets for my office. DOH. 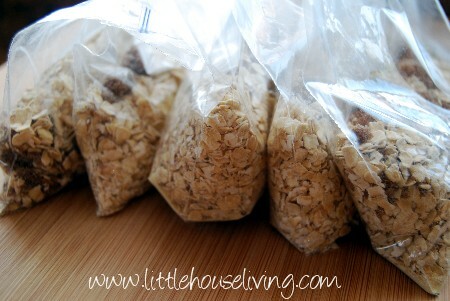 I don’t add milk or sugar but I do add golden raisins which I’ll just throw into the premeasured oats into each bag. Thanks! Oh wow! I wish I’d known about this recipe when the kids were at home! This is such a great idea…now that they are grown, I could still make some up and put them in a basket with some vintage bowls and spoons and make a gift set out of it! Does anyone know where I can pick up powdered milk without it costing me an arm and a leg? Every place that I have went around here the powdered milk is sky high. Did you know…… you do not need “instant” oatmeal to do this? I do not make packets because what do you do with the baggy when you are done? and use a plastic bowl like container with a lid (it has been a long time since I’ve hiked far enough to need breakfast). Usually I just measure out what I need at home…..one part oats to two parts water and micro-wave for one minute. If I have to take it somewhere (like school) I put my “stuff” into a smaller reusable plastic container. Raisins, ground psylliam and flax seed, walnuts, fruit (I am not a fan of sweet oatmeal, raisins seem sweet enough). I had not thought of using powder milk…..good idea! I have milk allergies in my kiddos. Is it ok to just omit the powdered milk and have them use milk to make it with instead of water? Thanks for the help. Walmart now has freeze dried strawberries that would be awesome in this recipe! Ok, Help..I made them sans milk powder (don’t want to use that), kids not impressed..I refuse to buy boxed anymore..Any Suggestions.. Try adding 1/8 teaspoon of salt to each baggie, and I’ll bet your kids will like it much better. I can’t eat oatmeal without a little added salt. And consider adding a tablespoon (or two) of dried fruit (I prefer raisins). Fruit adds natural sweetness, which is always a plus! I’m curious about the powdered whey. Is this the why I get at the nutrition store or is it different? where would I find powdered whey that you use for this recipe? I get it from my local co-op. I don’t think it’s the same as you would get in a nutrition store but I’m not sure. At my co-op it’s just a cheaper version of powdered milk! Ok..I have a challenge for you…Mac N Cheese.. Thanks..love your blog…..and I love trying your recipes! 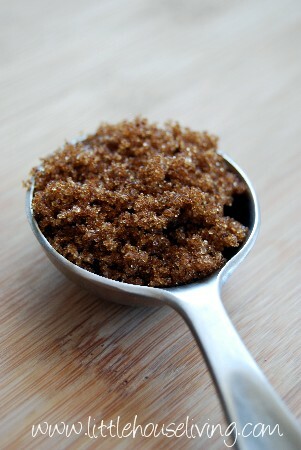 I love making maple and brown sugar. We keep a big canister on hand and it’s soooo much cheaper! My kids don’t care for the mixes.. 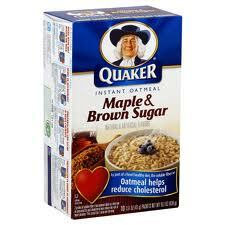 I just take 1/4 cup oats (regular or quick) and 1/2 cup water. I nuke this for 45 seconds, stir, nuke for 30 seconds and let it sit a couple minutes. I stir in 1/2 tsp. white sugar then top with 1 tsp. brown sugar. And the milk on top (depending on allergies, the one tat kid can have). That’s is for the girls. The boys prefer 1/2 cup oats and 1 cup water.. Some times I use a tbs less water so it is thicker. HI Marissa. I love your site and have been having a great time trying all the homemade recipes. I recently started blogging to share updates with family that lives a few hours away. Is there a way I can share your recipes or other posts through my blog? I am new to this and don’t to be stealing or anything. Thanks! You are welcome to post a link to a recipe, just don’t take pictures or copy the post please 😉 Good luck with blogging! I’ve been following you for a long time, but I don’t think I’ve ever commented here! I saw this and did a little squeal! I have 5 children, ages 6 months to 12.5 years old and are we busy! We are home every morning, but Tuesdays are our homeschool co-op mornings and we end up buying bagels and/or english muffins (whole wheat) for a fast breakfast to get us out of the door. I can’t stand to buy cereal — I simply freeze when I get close to the check-out counter with those boxes! This is a great alternative! We have been making baked oat for a long time, but it’s not so conducive to speed or travel, even. 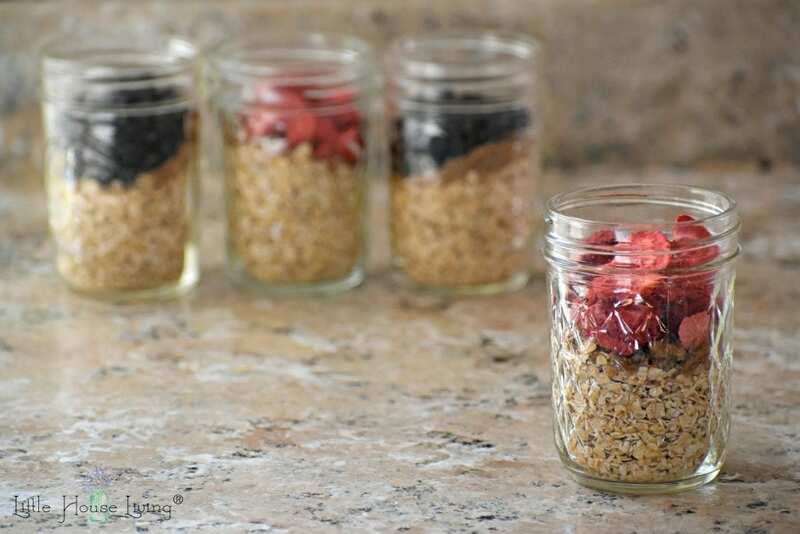 Here is what I am thinking: make these in pint jars, add the hot water from teh stove (no microwave ehre) and then they can even take them in hand out the door! Now…..just to get them BACK in the house to wash…..
Oats are a wonder food! I like the chewy version with old fashioned oats. The instant stuff makes more of a pudding (or baby food). I use plastic bowls with lids instead of baggies. We like to add anything from coconut to sunflower seeds to our oatmeal. At home, we add frozen banana chunks before we add the boiling water and plenty of cinnamon. Bananas get over ripe so fast, so I freeze them (peeled) they are easy to chop and excellent in smoothies, whipped they make a delicious ice-cream, etc. Love your site. Grateful for the lovely ideas. Thank you for sharing your ideas and creativity. I’am so excited to try your recipes with my family and make my life simple too! Absolutely love your page. 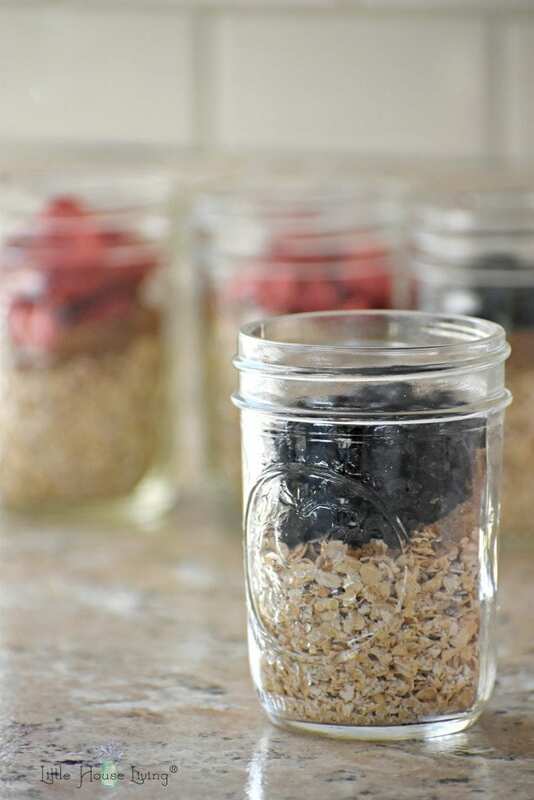 Especially these breakfast oatmeal packs made in advance. 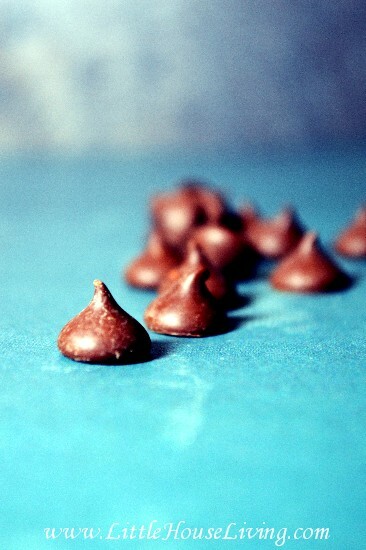 My son loves the brown sugar version, however, my favorite is Apple’s, cinnamon & raisins. Do you have recipe for this? For that I would just add a small spoonful of raisins and dried apples into the dry mix packet 🙂 Oh and just a bit of cinnamon. 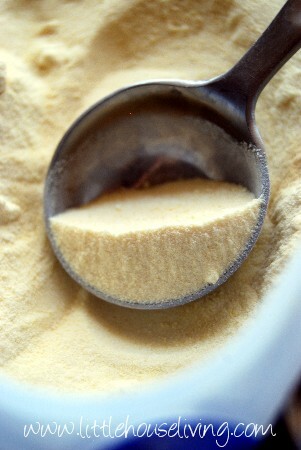 I am curious if you know a substitute for the powdered milk, something non-dairy? My kiddo is allergic and often we can’t use the store bought brands because of this. Thanks! What is involved in the making of “Quick Oats”? How do they make them “Quick”? I’ve always been a little suspicious of that. This also works great in small canning jars, makes no waste since the jars are reusable. They have a lid so you can make it and take it with you. I make mine all the time. I don’t use the powdered milk or whey. I just add water and then if I need a little milk I put it in when it comes out of the microwave. I add my own dried fruit too that way I don’t need sugar. The fruit is enough sweetness. I also add a little cinnamon if I’m using my dehydrated apples. Even have my hubby eating them and I take them to work. Even took them on vacation in Feb!!! Would Organic Rolled Oats work for the instant oatmeal packets? They should work you just may have to warm them up a bit longer with the warm water or put them in the microwave to make sure they are cooked. They aren’t quite as “instant” as the quick cooking oats. We love your baked oatmeal recipe but couldn’t find it on your site. Is there a specific link to it? I currently buy the instant packets because i have no micro and also no time in the am. I heat my kettle pour the hot water over strir n go. Will that work with these? If so, I am SO in! !